Motorola Cliq 2 Review - Learn everything you need to know about the Motorola Cliq 2 before you buy. 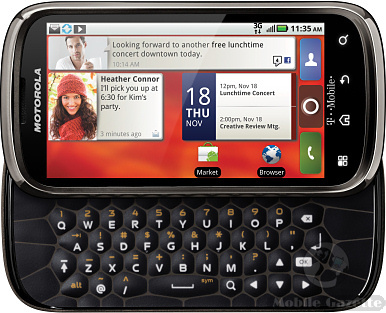 -The Motorola Cliq 2 is a great mid-range phone for T-Mobile users. It supports Android 2.2/Froyo while running Motoblur on top. There are a lot of users not to happy with the Motoblur interface, but I personally don’t think it’s that bad. It offers a 5 MP camera while shooting 480 X 720 video (not HD). If you need a slide out keyboard, the honeycomb layout of the Cliq 2 is very responsive. It does support Wi-Fi calling so as to not use up your minutes. Overall, the Motorola CLIQ 2 has a lot of nice features that allow for a good amount of customization. -The CLIQ 2 is a sleek looking phone with a good weight to it that hardly feels cheap in your hand. It has a 3.7-inch 854 X 480 WVGA screen that produces really nice colors but has a hard time in direct sunlight or if you aren’t looking at it straight on. The design on the QWERTY keyboard looks really nice, but there is a bit of wasted space on the sides. The touch capacitive buttons on the home screen are typical Motorola and function nicely. -The camera, again, is 5 MP shooting video in 480p. Not HD but it does just fine for sharing video through messaging or even to YouTube. One nice feature about the camera is that after you take a picture, it takes you back to the live camera. Having to press a button to get back to the capture screen is a bit annoying so it’s nice Motoblur took care of this. -The official battery time on the website says 7.9 hours of continuous talk time with 13 days of standby. If you are heavy user you should be able to get by one full day and a little bit without having to charge it. -Wi-Fi calling is a great extra feature on this phone that allows you to make calls on a wireless network while not using your minutes. We had a great experience with this and would highly recommend it. The CLIQ 2 can also become a Wi-Fi hotspot for up to 5 devices-pretty cool. Of course it also comes with GPS and Bluetooth. "We did get our check with no problem. I have used your company in the past and the service is great. I also have shipped over 130 phones to your company in the past few years and have referred other people to Pace Butler. Thanks again." "Thanks so much! I will recommend pacebutler to my co-workers, friends and family. Rebecca, you really set a high standard for customer service. You have a real positive energy about you and take on challenging customer concerns/issues with great ease and deal with them with effortlessly. All I can say is that the company is real lucky to have you on their team. No amount of advertising places the company out and exposes them in such a positive light."